The European electorate in Rhodesia showed little willingness to accede to African demands for increased political participation and progressively replaced more moderate party leaders. In April 1964, Prime Minister Winston Field, accused of not moving rapidly enough to obtain independence from the United Kingdom, was replaced by his deputy, Ian Smith. Prime Minster Smith led his Rhodesian Front Party to an overwhelming victory in the 1965 elections, winning all 50 of the first roll seats and demoralizing the more moderate European opposition. The British Government considered the UDI unconstitutional and illegal - the first national treason against the Crown since the American War of Independence - but made clear that it would not use force to oppose it. On November 12, 1965, the United Nations also determined the Rhodesian Government and UDI to be illegal and called on member states to refrain from assisting or recognizing the Smith regime. 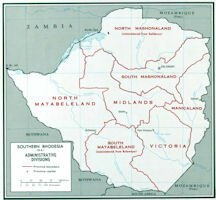 The British Government imposed sanctions on Rhodesia and requested other nations to do the same. The economic and political existence of Rhodesia was evidence that the United Nations' sanctions had not been completely effective. Facilities in neighboring countries, especially the Republic of South Africa, were available for transshipment of goods and transfer of funds to and from Rhodesia making it extremely difficult if not impossible to establish the degree of compliance of US corporations and individuals with the letter and intent of the Security Council sanctions. In 1971, the US Congress paesed the Byrd Amendment to the Military Procurement Authorization Act (Public Law 92-156), permitting import of strategic and critical materials from Rhodesia. Since that time, the United States has been importing chrome ore, ferrochrome, nickel, asbestos and other strategic materials from Rhodesia in violation of UN sanctions but within the bounds of national law. In the early 1970s, informal attempts at settlement were renewed between the United Kingdom and the Rhodesian administration. Following the April 1974 coup in Portugal and the resulting shifts of power in Mozambique and Angola, pressure on the Smith regime to negotiate a peaceful settlement increased. In addition, sporadic antigovernment guerilla activity, which began in the late 1960s, increased dramatically after 1972, causing destruction, economic dislocation, casualties, and a slump in white morale. In 1974, the major African nationalists groups - the Zimbabwe African Peoples Union (ZAPU) and the Zimbabwe African National Union (ZANU), which split away from ZAPU in 1963 - were united into the "Patriotic Front" and combined their military forces, at least nominally. The comprehensive sanctions imposed by the UN Security Council on 29 May 1968 against Rhodesia were unlikely to have much more effect in forcing Salisbury to relinquish its independence than previous limited sanction efforts. So long as South Africa and Portugal refused to comply with the Security Council’s demand, Rhodesia was able to sell sufficient exports and obtain necessary imports to maintain its economy. Most of Rhodesia’s foreign trade had been reoriented to adjust to previous sanctions and already either was with South Africa and Portugal or was carried out through disguised trade arrangements. Moreover, the country was more self-sufficient than at the time of its Unilateral Declaration of Independence in late 1965 and was, therefore, better able to cope with the increased sanctions. Most of the adverse effects of voluntary sanctions fell on Zambia, whose economy was considerably shakier than when Rhodesia proclaimed its independence on 11 November 1965. Zambia had little success in its frenetic efforts up to 196 to find alternative transport routes and thus reduce its critical dependence on Rhodesia. Zambia and Congo (Kinshasa) were not able to apply trade sanctions fully against Rhodesia without bringing serious economic damage to themselves. Without Rhodesian coal, Zambian and Congo copper production would have to be cut back drastically. Moreover, Rhodesia can retaliate against sanctions by refusing to supply Zambia with electric power, which is essential to the copper industry, or by refusing to carry most of the country’s imports and exports, on which the Zambian economy is dependent. Although the UN resolution requested member states to assist Zambia, there was little that could be done over the next few years to replace the essential goods and services supplied by neighboring Rhodesia. A series of education acts impacted on education in Rhodesia. These Acts are the: (1) 1899 Education Ordinance; (2) 1903 Education Ordinance; (3) 1907 Education Ordinance; (4) 1929 Department of Native Development Act; (5) 1930 Compulsory Education Act; (6) 1959 African Education Act; (7) 1973 Education Act; and the (8) 1979 Education Act. These Acts were developed in order to protect the settlers' economic advantage and because most Euro-Rhodesians believed that contact with Africans should be minimised and controlled, and that differential rights and privileges for the two culture groups were necessary. The Rhodesians thought that only after the African people had been "civilised", that is completely acculturated into the European world view, that they could then lead equal but separate lives. In general the colonial settlers in Southern Africa believed that African people were intellectually and culturally inferior in comparison to European people. European educationalists and psychologists in the Southern African region conducted an array of research to "prove" that people of African descent were intellectually and culturally inferior to people of European descent. As such, the education of Africans in Rhodesia was of little importance except in terms of labor production. It was these attitudes that led to the development of racist educational legislation in Rhodesia. In general this legislation defined the role of Africans as little more than servants and laborers of the Rhodesian settlers. Government infrastructure – schools, clinics, animal dip-tanks and local government – had been wiped out in the more isolated 'native reserves' or Tribal Trust Lands [TTL], where most of the approximately six million Africans lived. Guerrilla commissars, especially in eastern Rhodesia, along the long porous border with Mozambique, built rudimentary administrative systems to support Mugabe's Zimbabwe African National Union (ZANU) party. In 1976, because of a combination of embargo-related economic hardships, the pressure of guerilla activity, independence and majority rule in the neighboring former Portuguese territories, and a UK-US diplomatic initiative, the Smith government agreed in principle to majority rule and to a meeting in Geneva with black nationalist leaders to negotiate a final settlement of the conflict. Following elections in April 1979, in which his UANC party won a majority, Bishop Muzorewa assumed office on June 1, becoming "Zimbabwe-Rhodesia's" first black prime minister. However, the installation of the new black majority government did not end the guerilla conflict that had claimed more than 20,000 lives since 1972. Estimates of the size of the insurgent forces vary considerably, but numbers were believed to have been over 50,000 in 1979. Not all of these, however, were sufficiently armed or trained to be considered combat effective. In the late 1970s about 15,000 guerrillas were active inside Rhodesia at any given time, most of them from ZANLA. Ranged against the guerrillas in 1972 were security forces and reserves that numbered under 50,000 men. These were incorporated in a small, white-officered regular army of 3,400, of whom 80 percent were black, backed up by 8,000 white reservists. Equipment was old but well maintained. The air force inventory consisted of fifty-five aging aircraft that were nonetheless adequate to keep air superiority over any potential African enemy. The air arm could also strike at will against enemy bases in Zambia and Mozambique, and its helicopters were used effectively in counterinsurgency operations. The tough paramilitary police force, 6,400 strong and two-thirds black, was reinforced by a predominantly white reserve of nearly 30,000. Rhodesian security forces expanded dramatically in the late 1970s. By 1979 the regular army consisted of 10,000 men, including 3,200 white conscripts, trained reservists, organized in the Territorial Army, numbered about 15,000. Air strength was enhanced by the delivery of additional aircraft from South Africa. Rhodesian regular forces had high morale, and all components were well trained for their missions. But the demands imposed by stepped-up guerrilla activity after 1976 stretched meager white manpower resources. White reservists up to the age of forty-eight were liable to call-up for 190 days annually. Long periods of service in the field had a brutalizing effect on the white population as a whole, put strains on family life, reportedly contributed to a high incidence of alcoholism, and late in the war led to an increased emigration of whites of military age. Reinforcements could have been obtained from the large pool of black manpower, but fear of infiltration and mutiny prevented the government from exploiting it fully as a source of volunteers. Attempts to conscript Africans after 1978 met with resistance. 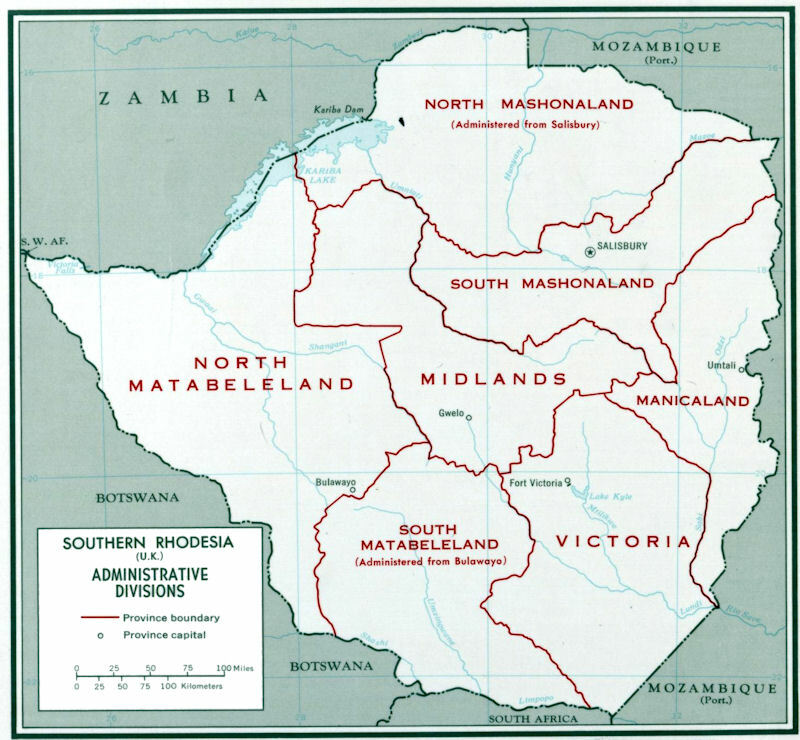 On December 10, 1979, in preparation for the transition under British authority to officially recognized independence, the "Zimbabwe-Rhodesia" reverted de facto to colonial status. On December 12, British Governor Lord Christopher Soames arrived in Salisbury to reassert British authority over the colony. His arrival signaled the end of the Rhodesian rebellion and the "internal settlement," as well as the beginning of Zimbabwe's transition to independence.